After discovering an ancient painting, the Royal House Museum invites you to explore the recovered artifacts, and the mysteries within. Restore the royal amulet to break an ancient curse and stop an evil witch from regaining her terrible powers! 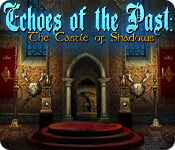 Dive into Echoes of the Past – The Castle of Shadows and save the royal family from their curse and explore a fascinating world full of Hidden Object scenes, and perplexing puzzles. Play Echoes of the Past: Royal House of Stone! Investigate a military hospital that hosted a variety of terrifying experiments in The Agency of Anomalies: Mystic Hospital! Manage five different farms around the world, as you try your hand at penguin breeding and jewelry making in Farm Frenzy 3!